The two day protests (19-20 October) of the Greek working people constitute a landmark in modern Greek history. The protests of October have fundamental differences from the protests of last summer. In spite of the Government’s hopes, the doubts of the right wing opposition, the hesitation of the new left and the downright skepticism of the Communist party Syntagma Square continued to attract anti-austerity protesters. It is true that it was a completely uncoordinated crowd: from the nationalist wing to the apolitical, self-serving taxi drivers, from the unemployed to the civil servants, from the extreme right wing to the rebellious students, from the General Confederation of Greek workers to the shop keepers union. All these groups were brought together by their inability to survive under the austerity measures and the heavy and unjust taxation imposed in the name of “national salvation”. This rising, heterogeneous movement was headless. The new factor in this uprising is that the Communist party of Greece decided to claim the hegemony of the movement. PAME, a Unionist Front by its own definition, the Communist party’s expression in the union movement, stated their decision to protest in Syntagma Square on the 19th and to take part in the Parliament siege on the 20th. This announcement was hailed as positive by the majority of the other groups of the movement since it would reinforce the common struggle. What was not immediately clear was that PAME considered the Square as its own grounds and did not take kindly, to say the least, to other forces, like the “DEN PLIRONO” ( “I don’t pay movement”)demonstrating next to them. This attitude is not new in the purist attitude of the Communist Party of Greece. Their protests and marches are always strictly organized and separate from the other forces in order to protect them from agents provocateurs. The Syntagma Square crowd is something unknown to them. The clashes were inevitable and when the hooded so-called anarchists tried to go through the PAME ranks to reach the Parliament a full assault developed. The police stayed back, throwing tear gas and chemicals only when directly attacked. The outcome of a few hours of generalized street fighting was one of the PAME protesters dead and several others injured. On the political level the great loss was that the focus was turned away from the real issue, the voting of the new austerity measures in Parliament, to the fights outside it. 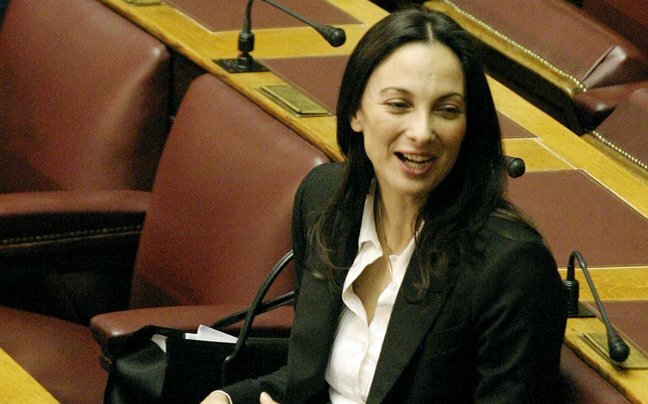 The only casualty in Parliament was Ms Luca Katseli, former Finance Minister, who voted against article 37 of the new law and was ousted from the PASOK Parliamentary group. Temperatures are rising in Greece. The thermometer in my balcony shows 33 degrees in the shade!! The political thermometer is reaching unprecedented temperatures too. PASOK members of Parliament claim that they are attacked and humiliated whenever they go into public. The Government blames the left for these incidents but noone is convinced. Mr. Athanassiadis, Member of Parliament for PASOK, claimed that he decided to vote for the 2nd Memorandum despite his doubts and criticism because he was threatened over the phone!!! His claims have not been investigated so far. Needless to say that the younger generation is leaving the country en masse. Some of the older ones who were studying abroad are now staying on and helping the new arrivals. Worse is expected as from September when the private sector will also be hit, when schools will open and parents will be forced to face more expenses together with more strikes since both University and High School teachers are up at arms against the education reform. In the meantime, the Syntagma Square “enraged” are organising a coordination meeting with the Assemblies of other squares in Athens’neighbourhoods and other towns all over Greece. 8 and 9 July they will meet in Syntagma under the shadow of the Municipality’s request that they evacuate the Square. At a time when normally people would be discussing their holidays now they get organised to visit their families in the village or their friends who have a seaside house since they cannot afford hotels anymore. On the other hand, the open air cinemas have started working, providing a much needed relaxation; new take away cafes are operating on the beaches where you purchase your coffee and drink it walking by the seaside. The silver lining in this cloudy atmosphere is that the majority of the citizens is becoming aware of the corruption of the ruling parties and the way they and their needs have been exploited.